Copyright: © 2018 Rasheed A, et al. This is an open-access article distributed under the terms of the creative commons attribution license, which permits unrestricted use, distribution and reproduction in any medium, provided the original author and source are credited. Background: Many sedation scales and tools have been developed and compared for validity in critically ill patients. Objective: The aim of this study is to compare the reliability of two sedation scales; RAMSAY sedation scale and Richmond Agitation Sedation Scale (RASS) in the adult intensive care unit. Methods: 290 patients in intensive care unit were recruited for the study and were independently assessed for sedation effect by investigator and bedside nurses simultaneously using RAMSAY scale and RASS scale. Results: Agreement between the nurse and researcher scores on RAMSAY scale (weighted κ=0.449, p<0.001) indicating weak level of agreement. Agreement between the nurse and researcher on RASS scale (weighted κ=0.879, p<0.001) indicating strong level of agreement. Cronbach’s alpha analysis showed that 10 items of RASS had excellent level of internal consistency (α=0.989) compared to good level of internal consistency of RAMSAY scale (α =0.828). Conclusion: RASS showed excellent inter-rater agreement compared to weak inter-rater agreement of RAMSAY scale. The results also support that RASS has consistent agreement with clinical observation and practice among different observers. The results suggest that use of RASS is linked to more reliable assessment of sedation levels in the ICU. Patient anxiety, restlessness, agitation, aggressiveness and pain are among the most common reasons to start sedation and analgesia for critically ill patients [1,2]. Maintaining of patient care-devices is an additional reason. Sedation aims to promote patient tolerance and adaptation to tracheal intubation and mechanical ventilation, in addition to enhance daily care and nursing procedures in the Intensive Care Unit (ICU) [2-4]. 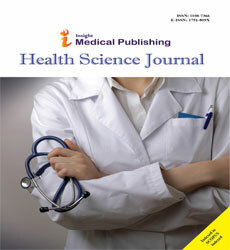 A systemic review study evaluated the sedation practice and its impact from 82 study, it showed that proper use of sedation can improve patient outcomes and optimize resource usage; this includes reduction in duration of mechanical ventilation days, reduction in weaning duration, reduced length of stay in the ICU, reduction in hospital stay . Yet the optimal sedation practice varies among different ICUs worldwide [2,6]. Sedative agents and targeted sedation level may vary according to the individual medical condition of patients and their treatment needs . While some patients in the ICU need deep sedation, still there are some other patients needed light or no sedation . Although the clinical benefits of sedation and analgesia in ICU are enormous, still its use is associated with significant adverse effects and complications. Many studies showed that excessive use of sedation in ICU is associated with prolonged stay, prolonged mechanical ventilation and risk of infection and mortality rate [8-10]. Patients who are inadequately sedated resist assisted mechanical ventilation and might attempt to harm themselves by removing invasive devices or attempting unplanned self extubation [8,11,12]. Therefore, it is very important to titrate sedation level according to desired patient outcomes and targeted patient response. The evaluation of sedation adequacy is a bedside maneuver, in which nurse’s assessment is critical, as he or she often observes any variation from an optimal or targeted level of sedation . The use of sedation scales to target proper sedation level has been linked to decreased use of sedatives, analgesic and inotropic agents, decreased ventilation hours in critically ill patients, and decreased risk for delirium for critically ill patients [13-18]. Typically, sedation scales are used to titrate sedative drugs appropriately. Many instruments for measuring the level and effectiveness of sedation in adult had been developed . De Jonghe et al. 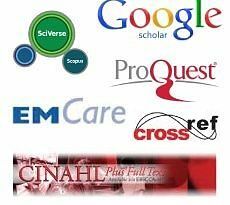 had reviewed 25 studies discussing 25 tools to assess sedation effectiveness in the ICU. RAMSAY sedation scale (RSS), was introduced in 1974 to help in titrating sedation to a targeted outcome . Subsequently, many scales and tools have been developed and compared for validity [21,22]. Riker Sedation Agitation Scale (SAS) [23,24], Richmond Agitation Sedation scale (RASS)  in addition to other used scales. Studies showed that both (RASS) and RSS have excellent inter-rater reliability and validity beside the feature of “easy to use” by nurses [23,25-29]. We conducted this study to compare the reliability of RAMSAY sedation scale and (RASS) in the adult intensive care unit. This is a cross-sectional study that was carried out between April 2017 and March 2018. A total number of 290 ICU who had met the inclusive criteria were recruited for the study and were independently assessed for sedation effect by investigator and bedside nurses. Sedation scoring was performed as standard care for sedated patients using RAMSAY scale. Bedside nurses were requested to score the patient sedation level on additional sedation scales (i.e., RASS). The bedside nurse and investigator were approaching the patient simultaneously, concurrent and separate scoring was measured and recorded by the investigator to validate bedside nurse ranking and define any variation in scoring between bedside nurse and investigator (if present). Bedside and RASS) with related competency approved according to the guidelines provided in original tools, Figures 1 and 2. Figure 1: RAMSAY sedation scale . Figure 2: Richmond agitation sedation scale . IRB was approved for this study. Inclusive criteria included: all ICU patients who spent at least 24 hours in the ICU and older than 14 years old. Exclusion criteria were patients with structural or metabolic neurological deficit (as identified by documented medical diagnosis on patient’s file). Informed consent had been obtained from each patient guardian/ relative. The research was conducted in the ICU of King Saud Medical City (KSMC) which has 120 ICU bed capacities. The ICU in KSMC provides care for different categories of critically ill patients who need comprehensive stabilization. On average, 196 patients are admitted every month. Around 100 patients are receiving care in ICU every day; 50-60 patients-on averageis connected to assisted mechanical ventilator and may need certain amount of sedation based on clinical decision. Cross sectional design was used for selecting the patient’s enrollment in the study. All newly admitted patients who were admitted from the first day of the month during the study period and had met the inclusive criteria were recruited for the study. SPSS (version 21) program was used for analysis. Descriptive study factors were expressed with N (%) for categorical variables, and mean +/− SD for continuous variables. To test criterion validity, Spearman’s correlation coefficient was computed to compare scores of RAMSAY and (RASS) between bedside nurse and investigator. Bedside nurse and investigator’s scoring were compared using an equally weighted Cohen’s kappa coefficient. 290 patients were recruited in the study, Table 1 shows summary of patients demographic and clinical characteristics. 70.7% of patients are male and 29.3% are female. The patients mean (SD) age was 48.5 (1.03), ranged from 22-85 years and median was 52 years. 168 (57.9%) patients were on assisted mechanical ventilation when received sedation. Out of 290 patients encountered, 137 (47.2%) patients received sedation during the first 24 hours of admission. Sedation administration as infusion was the most common mode of administration (38.6%). Out of 136 sedated patients, 64 patients (22.1%) did not receive sedation vacation. The mean (SE,SD) RAMSAY scores were 3.96 (0.099, 1.16) and 3.85 (0.12, 1.44) for the nurses and researcher, respectively. The mean (SE,SD) (RASS) scores were -2.03 (0.14,2.41) and -2.05 (0.14,2.44) for the nurses and researcher, respectively. Table 1 Summary of patient’s demographic and clinical characteristics. Among nurses scoring on RAMSAY scales, 89.8% scores were in the sedation range, 3.6% scores were in the agitation range and 6.6% scores were in the cooperative and oriented score; score=0. Among researcher RAMSAY scores, 83.2% were in the sedation range, 8.8% were in the agitation score; score=1, and 8.0% were cooperative and oriented; score=2 (Table 2). Results showed strong association in RAMSAY scale score between nurses researcher (Pearson Chi-Square=206.52, p<0.001). Among nurses (RASS) scores, 63.5% were in the sedation range, 11.4% were in the agitation range and 25.1% were zero. Among researcher (RASS) scores, 63.1% were in the sedation range, 9% were in the agitation range, and 27.9% were zero (Table 3). There was strong association in (RASS) score between nurses and researcher (Pearson Chi- Square=1854.09, p<0.001). Table 2 Comparison between frequency of nurses and researcher scoring on RAMSAY scale levels (n=137). Table 3 Comparison between frequency of nurses and researcher scoring on RASS levels (n=290). Agreement between the nurse and researcher scores on RAMSAY scale (weighted κ=0.449, p<0.001) indicated weak level of agreement. On the other hand, Agreement between the nurse and researcher RASS scores (weighted κ=0.879, p<0.001) indicated strong level of agreement. Internal consistency was tested for both tools. Cronbach’s alpha analysis showed that 10 items of RASS had “excellent” level of internal consistency (α=0.989) compared to “good” level of internal consistency of RAMSAY scale (α=0.828). RASMAY has been used since many years to assess level of sedation in ICUs . RASS has been used internationally in many ICUs and developed to enhance simplicity, clarity and ease of use [25-28]. In this study, RASS has shown excellent inter-rater agreement (weighted κ=0.879, p<0.001) compared to weak inter-rater agreement of RAMSAY scale (weighted κ=0.449, p<0.001). The results also support that RASS has consistent agreement with clinical observation and practice among different observers [25-27]. RAMSAY scale had been originally developed to be used only for sedated patients to monitor level of sedation . The fact that the RASS has an expanded set of clinically relevant scores for tracking both agitation and sedation, makes it well suited for better understanding of both states (sedation and agitation) . Unlike other sedation scales that describe only the level of sedation, RASS can be used for all hospitalized patients to describe agitation, alertness and sedation level . RASS can be used to assess responsiveness even in patients who are not receiving sedatives . In addition, RASS can help in applying other clinical tools. RASS is the first step in describing ICU delirium using Confusion Assessment Method in the ICU (CAM-ICU), validated tool for delirium assessment among critically ill patients in ICU. RAMS A Y scale has limited ranking for agitation status and levels of restlessness; one score only describes agitation . Since RASS can be used for all patients (regardless on sedatives or not) bedside nurses can continuously observe for patient’s awareness and recognize for both types of delirium; hyperactive and hypoactive . In our hospital, we adopted RASS to replace RAMSAY scale in order to control sedation practice in a better way. Medical and Nursing teams had received extensive program of awareness and training. Doctors are assessing patients on daily basis and determine the” target RASS score “for each patient according to his/her clinical condition. The bedside nurses are monitoring patients and record each patient’s score on RASS at least every four hourly, bedside nurses are titrating sedatives to achieve target RASS score accordingly. Furthermore, using RASS has been linked to start observing delirium in our ICU populations. CAM-ICU has been started concurrently in our ICU with start using of RASS. In this study, RASS showed excellent inter-rater agreement compared to weak inter-rater agreement of RAMSAY scale. The results also support that RASS has consistent agreement with clinical observation and practice among different observers. The results suggest that use of RASS is linked to more reliable assessment of sedation levels in the ICU. Bareen D, Karabinis A, Malbrain M, Morais R, Albrecht S, et al. (2005) Decreased duration of mechanical ventilation when comparing analgesia-based sedation using remifentanil with standard hypnotic-based sedation for up to 10 days in intensive care unit patients: a randomised trial. Critical Care 9: R200-210. Kress JP, Pohlman AS, Hall JB (2002) Sedation and analgesia in the intensive care unit. Am J Respir Crit Care Med 166: 1024-1028. Ostermann ME, Keenan SP, Seiferling RA, Sibbald WJ (2000) Sedation in the Intensive Care Unit A Systematic Review. JAMA 283: 1451-1459. Kress JP, Hall JB (2006) Sedation in the mechanically ventilated patient. Crit Care Med 34: 2541-2546. Jackson DL, Proudfoot CW, Cann KF, Walsh T (2010) A Systemic review of the impact of sedation practice in the ICU on resource use, costs and patient safety. Crit Care 14: R59. Mehta S, Burry L, Fischer S, Martinez-Motta JC, Hallett D, et al. (2006) Canadian survey of the use of sedatives, analgesics, and neuromuscular blocking agents in critically ill patients. Crit Care Med 34: 374-380. Devlin JW (2008) The pharmacology of oversedation in mechanically ventilated adults. Curr Opin Crit Care 14: 403-407. Kress JP, Pohlman AS, Jesse B (2002) Hall Sedation in the intensive care unit. Curr Opin Crit Care 8: 290-298. Junior GRR, Amaral JLG (2004) Influence of sedation on morbidity and mortality in the intensive care unit. Sao Paulo Med J 122: 8-11. De Jonghe B, Cook D, Appere-De-Vecchi C, Guyatt G, Meade M, et al. (2000) Using and understanding sedation scoring systems: a systematic review. Intensive Care Med 26: 275-285. Weinert CR, Calvin AD (2007) Epidemiology of sedation and sedation adequacy for mechanically ventilated patients in a medical and surgical intensive care unit. Crit Care Med 35: 393-401. Chevron V, Ménard JF, Richard JC, Girault C, Leroy J, et al. (1998) Unplanned extubation: Risk factors of development and predictive criteria for reintubation. Crit Care Med 26: 1049-1053. Payen JF, Chanques G, Mantz J, Hercule C, Auriant I, et al. (2007) Current practices in sedation and analgesia for mechanically ventilated critically ill patients: a prospective multicenter patient-based study. Anesthesiology 106: 687-695. Sessler CN, Grap MJ, Ramsay MAE (2008) Evaluating and monitoring analgesia and sedation in the intensive care unit. Critical Care 12: S2. Botha JA, Mudholkar P (2004) The effect of a sedation scale on ventilation hours, sedative, analgesic and inotropic use in an intensive care unit. Crit Care Resusc 6: 253-257. Yousefi H, Toghyani F, Yazdannik AR, Fazel K (2015) Effect of using Richmond Agitation Sedation Scale on duration of mechanical ventilation, type and dosage of sedation on hospitalized patients in intensive care units. Iran J Nurs Midwifery Res 20: 700-704. Dale C, Kannas DA, Fan VS, Daniel SL, Deem S, et al. (2014) Improved analgesia, sedation, and delirium protocol associated with decreased duration of delirium and mechanical ventilation. Ann Am Thorac Soc 11: 367-374. Mansouri P, Javadpour S, Zand F, Ghodsbin F, Sabetian G, et al. (2013) Implementation of a protocol for integrated management of pain, agitation, and delirium can improve clinical outcomes in the intensive care unit: A randomized clinical trial. J Crit Care 28: 918-922. Newton T, Pop I, Duva E (2013) Sedation scales and measures-a literature review. SAAD Dig. 29: 88-99. Schulte-Tamburen AM, Scheier J, Briegel J, Schwender D, Peter K (1999) Comparison of five sedation scoring systems by means of auditory evoked potentials. Intensive Care Med 25: 377-382. Devlin JW, Fraser GL, Kanji S, Riker RR (2001) Sedation assessment in critically Ill adults. Ann Pharmacother 35: 1624-1632. Riker RR, Picard JT, Fraser GL (1999) Prospective evaluation of the Sedation-Agitation Scale for adult critically ill patient. Crit Care Med 27: 1325-1329. Brandle KM, Langley KA, Riker RR, Dork LA, Quails CR, et al. (2001) Confirming the reliability of the sedation-agitation scale administered by ICU nurses without experience in its use. Pharmacotherapy 21: 395-518. Sessler CN, Gosnell MS, Grap MJ, Brophy GM, O'Neal PV, et al. 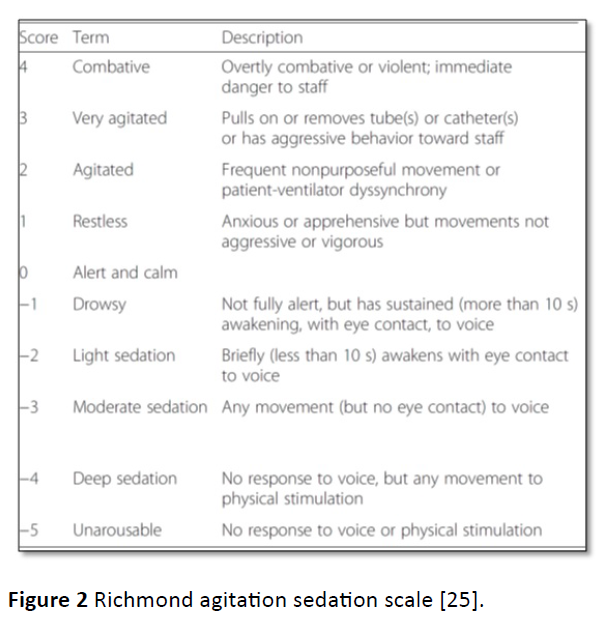 (2002) The richmond agitation–sedation scale: validity and reliability in adult intensive care unit patients. Am J Respiratory Crit Care Med 166: 1338-1344. Ely EW, Truman B, Shintani A, Thomason JW, Wheeler AP, et al (2003) Monitoring sedation status over time in ICU patients: reliability and validity of the Richmond Agitation-Sedation Scale (RASS). JAMA 289: 2983-2991. Namigar T, Serap K, Esra AT, Ozgul O, Can OA, et al. (2017) The correlation among the Ramsay sedation scale, Richmond agitation sedation scale and Riker sedation agitation scale during midazolam-remifentanil sedation. Rev Bras Anestesiol 67: 347-354. Mondello E, Siliotti R, Noto G, Cuzzocrea E, Scollo G, et al. (2002) Bispectral Index in ICU: correlation with Ramsay Score on assessment of sedation level. J Clin Monit Comput 17: 271-277. Kerson AG, DeMaria R, Mauer E, Joyce C, Gerber Lm, et al. (2016) Validity of the Richmond agitation- sedation scale (RASS) in critically ill children. J Intensive Care 4: 65.